Poor old Lonesome George has died: a heart attack, the report says. More like a broken heart - being 100 years old and the last of your species will do that to a tortoise. Or anyone, really. 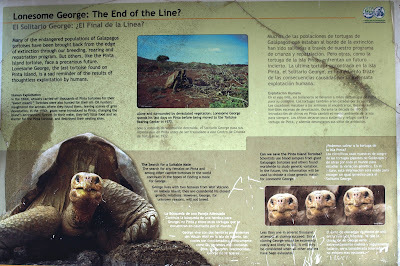 He certainly looked depressed when I saw him nearly three years ago, in his enclosure on Santa Cruz, Galapagos. Even though tortoise body language is a closed book to me, it seemed clear enough that he didn't have much to look forward to, on any given day. He wasn't actually alone: there were a couple of nubile teenage girls (in tortoise terms) in there with him who, while they weren't exactly the same as him, the last tortoise from Pinta Island, were similar enough for the keepers at the sanctuary to hope that he might be tempted to indulge in a bit of extinction-preventing how's-your-father. But no dice - and, more importantly, no eggs. As well as being sad, it's kind of ironic, because it was when he visited Galapagos in 1835 that Darwin accumulated the data that led to his formulating his theory of evolution - because of the differences between similar species, notably finches, on the different islands. The tortoises were all different too, which became George's problem after all his fellow Pinta Island torts were either eaten by sailors (including Darwin himself!) who had a thing for slow-moving fast food, or died because the goats they introduced destroyed the ecosystem. It's an old, old story, and it's not the last time we'll hear it told. But it is the last of George. Shame. Pft. A 7, but deep under the sea near a country town. Someone's TV got knocked over. Page 8 in the paper. We're not called the Shaky Isles for nothing, you know. But impressive to hear about it first from someone in Missouri!